Laurelwood's Organic Green Mammoth Imperial IPA is currently sitting on top of our Top 40 Portland Beers list. While we've seen many fluctuations on the list as more and more ratings come in, the Green Mammoth has had a consistent place near the top of the list since we started it two years ago. This beer makes very rare appearances, rearing it's beautiful tusked head every year or two—usually only on draft. As of last night, I heard it's still on tap at the 51st Ave location. 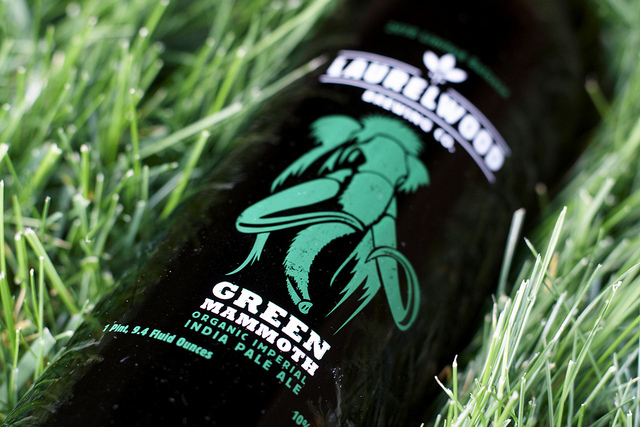 [UPDATE: Check the comment below from Laurelwood's brewer Vasili Gletsos for information on the availability of Green Mammoth, as well as upcoming releases of the Organic Deranger and Moose and Squirrel!] The photo above is from the inaugural silk-screened, swing-top release a few years back. The beer in it is long gone, but I've still got that bottle. Recently, a limited number of 22's were on the shelves, but I'd guess they've disappeared. If anyone's seen them recently, comment below! Remember, if you don't agree with some of these ratings, you can make a difference! Just go to any beer page and click on the Facebook Login button. Once you're logged in, crawl your way through the beer list and rate, rate, rate! The more ratings we get, the more useful this list will be in helping you find the best beer in Portland!